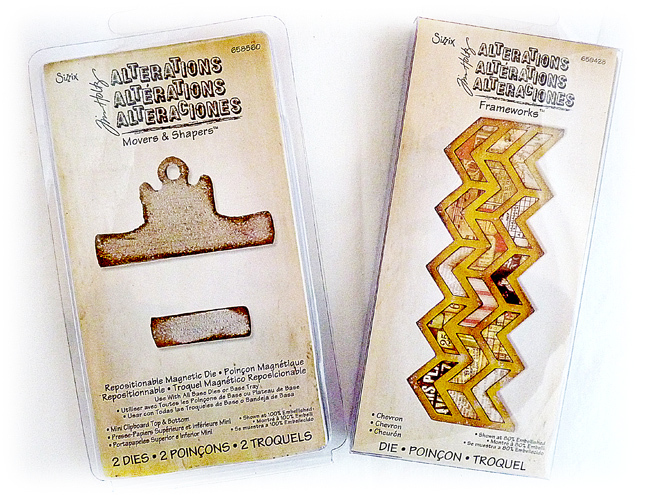 Today sees a 're-launch' of A Vintage Journey challenge blog. By re-launch we mean that there have been some significant changes to the focus of the challenges and additions to the genres acceptable for entry. 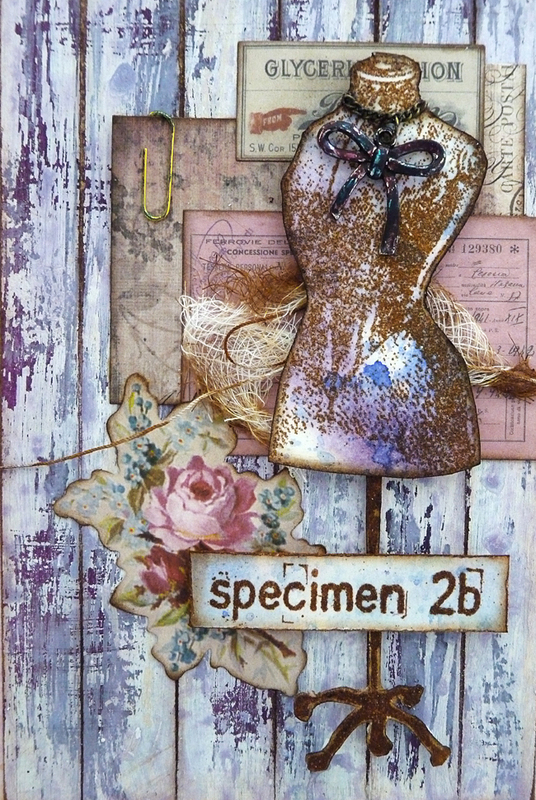 Although we still love Tim Holtz the challenges are no longer restricted to his inspiration, we have opened it up to include all artists and products and within vintage –shabby – mixed-media – art journaling – industrial and steampunk genres and through making tags, cards, canvas, 3D projects, ATCs, journals, assemblages, layouts and any altered art. So onto my project for the new look. I began by mixing quinacridone magenta with some prussian blue to create a gorgeous mauve and painted it over my card substrate. I went on to create a weathered wooden board effect using more media paints and vaseline and a technique I taught at some of my DecoArt workshops last year and demonstrated at Mixology 2015 last October. (Come back Monday to learn more). ... the dress form and stand have been stamped and cut out using vintage photo distress embossing powder which immediately brigs in my rust element. You'll also see I swapped out the lifetime word for the specimen 2b title which got the same treatment except I used vintage photo distress ink rather than embossing ink, this gave it a much deeper look as you can see from the two examples below. The bow on the dress form is a metal charm that has been painted and I also added a paperclip and rusty wire to hang the board up with completing all the elements required. 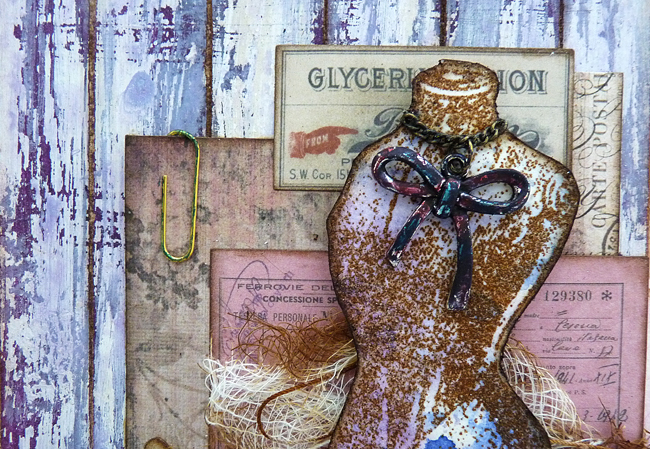 I added some cheesecloth dipped slightly in vintage photo distress ink behind the dress form to create more depth and interest and collaged the ephemera behind it all. vaseline, vintage photo distress embossing powder. I hope you can pop over to A Vintage Journey to see the wonderful inspiration from the team and also find out about the changes we have made. The sponsor this month is Andy Skinner so some new goodies to be won if you are lucky. I will be back on Monday with a Destination Inspiration post using exactly the same contents of the travel bag but a different project and there will be two tutorials one on my blog here and another over at AVJ. And just before you go I have a give-away to celebrate both the birthday challenge and my 6th blogaversary which was back in January. If you would like to be part of the draw then please leave a comment below and I will add your name when I add the numbers to Random Org which will be on the 18th March and I will announce the winner here on another special birthday on the 19th March. Thanks for being part of my creative journey. Have a great weekend and listen to your heART. Wow, wow, wow!!! Absolute fantastic background, Brenda! I definitely visit the AVJ on Monday for the tutorial! The collage is lovely too! A fabulous Project! Brenda offering inspiration of how to use the contents of the travel bag . As always your elements are selected and collaged perfectly. 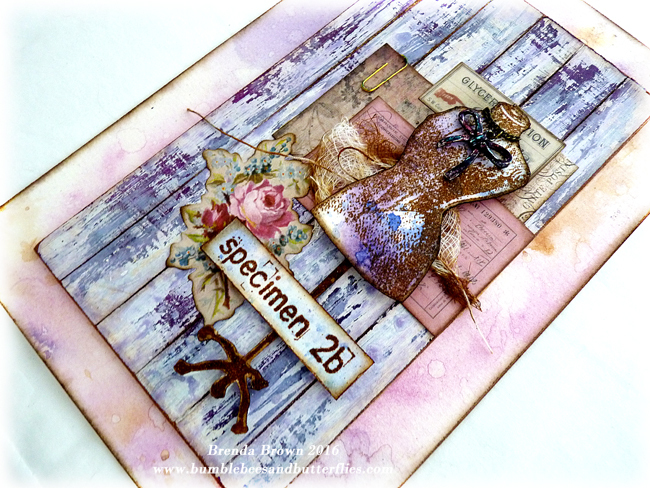 The weathered wooden board background is a real WOW and such a gorgeous blend of colours. love this project! 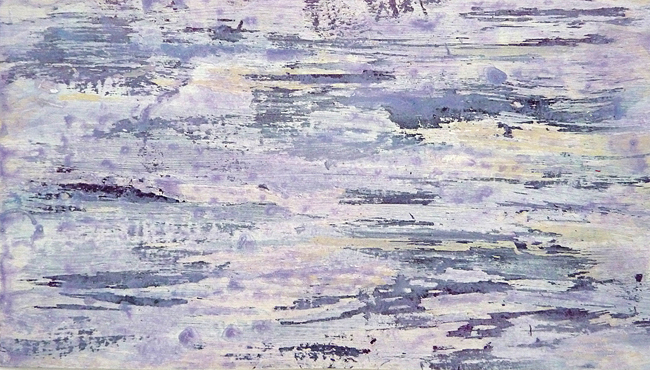 that background rocks - can't wait to try it in my art journal. thanks for the great inspiration - happy birthday! Awesome project and details, Brenda! Happy Birthday to the challenge and to your blog. Thanks for a chance to win! I absolutely adore the background Brenda, so really look forward to your DI on Monday. The rest is beautifully put together too! It has such wonderful vintage appeal! A great birthday celebration piece, love it!! wow - such a great work of art!!!! Beautiful Brenda! I especially love all the painted layers ! I love this project Brenda, and hope to give it a try. We are travelling this month, so something to look forward to when we get home. Awesome project Brenda, love the textures paint of the background as well as the super added details. You are such an inspiration! I like your projects a lot. And you are so talented with all the teqniques and details! Thanks for the chance to win! Brenda, das ist für mich schon hohe Kunst. Das ist ein tolles und fantastisches Werk, großartig zusammengestellt. I love this tag. It would look great in my sewing room. Thanks for sharing. Oh that wood-grain background is quite unique and stunning! What a great effect to go with all the other layers. Gorgeous hanging, Brenda! Hope you are having a great weekend! Hugs! 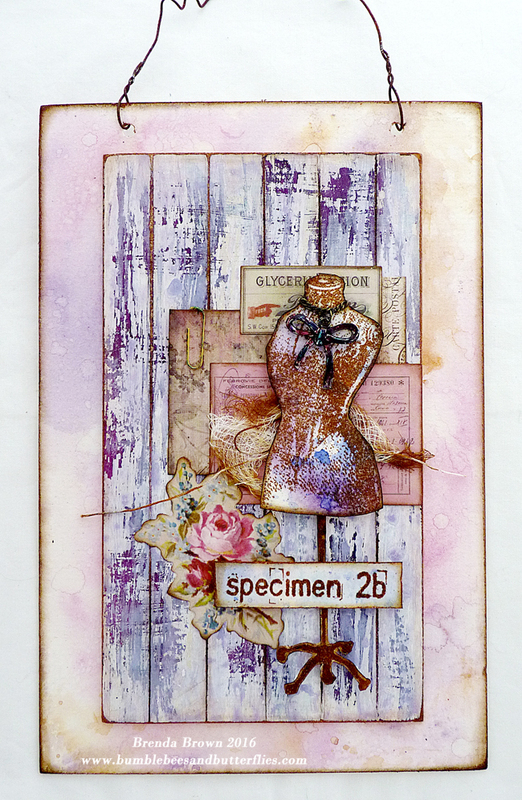 Great collaging over your glorious weathered wood background - what an amazing mauve you created with the paint mixing. Fabulous as always and a great way to celebrate the birthday and the new look. I really love this gorgeous rustic little work of art. The background is just perfect. Thank you so much, Barb, for the inspiration! I have Tim's dressform die but it's just a tad too tall for cards. I'll now cut off the bottom and use it that way. I love this card! It's just beautiful. Oh, my goodness! I've been oggling this lovely piece every time I visit AVJ, ad have been wanting to comment, but each time I do, I lose my Internet and have to be off to work. Anyhoo, this is an amazing work of art--love, love, LOVE that chipped wood background! I tried saving it to Pinterest at AVJ, so I could be sure to get back to it, but this durn computer won't let me do that either! And what a lovely gift you offer for your 6th blogaversary!!!! Huge congratulations on reaching that milestone! It is us who should be gifting YOU. You have been a huge inspiration to me, Brenda! Hugs! Gorgeous! Love the soft feminine feel with the rustic elements blended beautifully! Happy Blogaversary!